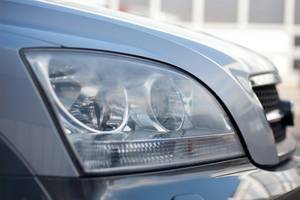 Restore your cars old foggy, cloudy or yellowed plastic headlight lenses to like new condition at a fraction of the cost of replacing them. 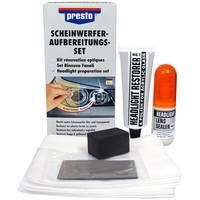 Achieve professional results with presto Headlight preparaion set. Not only do dull headlights detract from your vehicles appearance and value, foggy headlights are also a serious safety concern, in fact hazy plastic headlight lenses reduce visibility and create glare to oncoming traffic, putting you, your passenger and other vehicles at risk. The presto set includes everything necessary to achieve professional results, allowing you to repair your vehicle‘s plastic lens surfaces at tremendous savings.The included Lens Sealer offers an all-out protection for plastic headlight lenses. 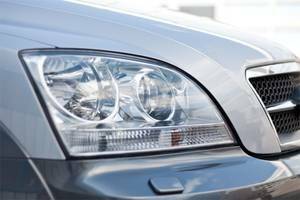 It's unique formula generates a hard and long lasting, weather- and detergent proof high gloss protection layer against environmental influences. The smooth dirt repelling surface keeps the lenses cleaner. When applied regularly, the integrated UV Protection reduces yellowing and foging significantly.